Each rosette is individually made: the inner and outer rings of the rosette are refected in the purfling around the soundboard and on the bridge tie block. 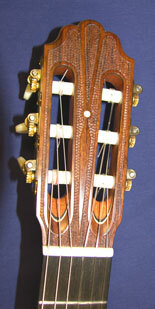 This new model took many months in development from my original model inspired by the guitars made by Antonio de Torres. 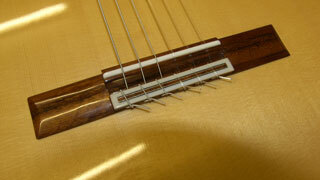 The European spruce soundboard is braced with 7 fan struts as my original Torres model. The sides are of a double laminate and the back of a triple laminate as can be seen in the description below. This refers to the approximate internal capacity of the soundbox and gives. for comparison, a more accurate size of the different models that I make. 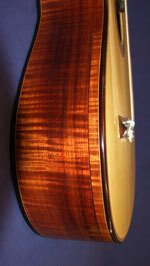 Amazaque head veneer with mother of pearl eye. 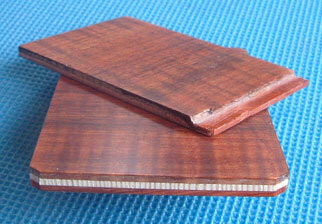 Inner 2.0mm Padauk, outer 2.0mm Tasmanian blackwood. 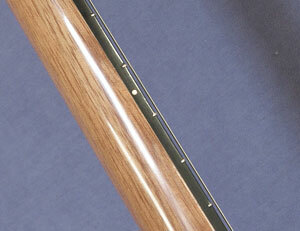 outer 2.0 mm Tasmanian blackwood.